Observed at night on wall of food preparation area. Upper Kerio Valley, Elgeyo-Marakwet, Kenya. Dec. 2015. 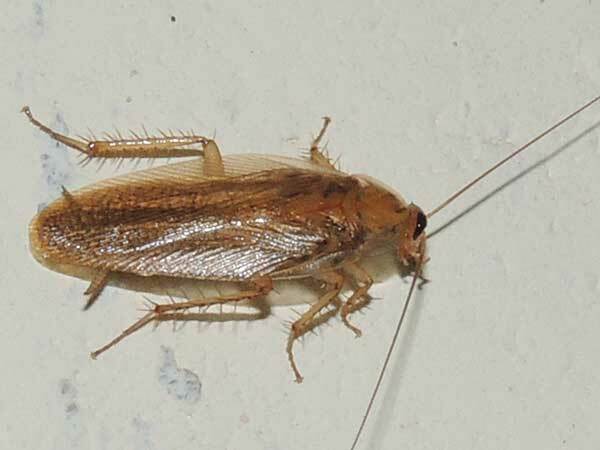 Natural habitats in the tropics are home to thousands of cockroach species - mostly very different than the few species that have taken up habitation with humans. The specimen here is appears similar to Blattella germanica which is found in human environments worldwide. The markings on the pronotum are a bit different making this likely to be a related species. These insects become very abundant in food preparation areas, particularly those in poor repair, with plumbing leaks, dilapidated structures and abundant waste food that is left available over night. Pesticides used indiscriminately to combat cockroaches become the real hazard as they certainly end up on food contact surfaces and directly in the food.